Response: The study, published in the journal Parasites & Vectors, showed that retaining water in the bromeliads’ leaf axils represent breeding sites for mosquitoes. The study titled “Ornamental bromeliads of Miami-Dade County, Florida Are Important Breeding Sites for Aedes aegypti,” also showed that the Aedes aegypti was the most dominant species of mosquito in the study’s test sites. “In south Florida, there were older reports that bromeliads contributed to mosquito breeding, but supporting evidence was minimal,” said the study’s lead author John Beier, Sc.D., a world-renowned Miller School entomologist, professor of public health sciences and director of the Division of Environmental and Public Health. 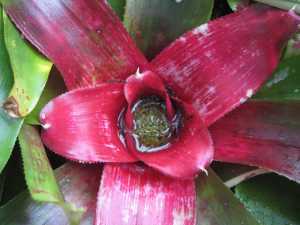 A variety of bromeliads are common throughout South Florida and are a popular choice for landscaping projects since they do not require much care. Beier urged against destroying the plants but said the new knowledge on the plant’s role in mosquito breeding will help tailor mosquito control efforts. “People should be aware that bromeliads are producing mosquitos so that they can treat the plants,” he said. In collaboration with Miami-Dade County Mosquito Control, the researchers surveyed ornamental bromeliads for the presence of immature mosquitoes at 51 locations across 11 neighborhoods in Miami-Dade, including three neighborhoods (South Beach, Little River and Wynwood) where the Zika virus was reportedly transmitted. The plants were surveyed during the summer of 2017. Researchers drained the reservoirs of the plants and screened the water for larvae. The plants yielded a total of 765 immature mosquitoes and five species: Aedes aegypti, Wyeomyia mitchellii, Wyeomyia vanduzeei and Culex. Response: “Aedes aegypti was the most abundantly collected species, as well as the most present, contrasting with previous studies, which do not consider bromeliads as important potential breeding sites for Aedes aegypti, including for South Florida,” said study co-author Andre Barretto Bruno Wilke, Ph.D. a post doctoral research associate with the Miller School’s Department of Public Health Sciences. caused by the Aedes aegypti mosquito emerge, Beier said that more research and operational control should be focused on the highly-adaptive mosquito. The Miami-Dade County Mosquito Control Division has greatly intensified vector-mosquito suppression efforts since the Zika outbreak in 2016. UM has been a major partner in research including mosquito mapping, surveillance and trapping. The collaboration is supported by the U.S. Centers for Disease Control and Prevention. Similar to the sudden Zika outbreak in 2016, researchers said vector-borne diseases are spreading to new areas due to urbanization, human movement and global warming. “Changes in the environment made by humans have a substantial impact on the ecology of mosquitoes, mainly due to a decrease in the number of species and an increase in the abundance of Aedes aegypti,” said Barretto Buno Wilke. “As a result, Aedes agypti becomes more present and can be found in greater numbers. Parasit Vectors. 2018 May 17;11(1):283. doi: 10.1186/s13071-018-2866-9. Ornamental bromeliads of Miami-Dade County, Florida are important breeding sites for Aedes aegypti (Diptera: Culicidae). Wilke ABB1, Vasquez C2, Mauriello PJ2,3, Beier JC4. This entry was posted in Author Interviews, Environmental Risks, Infections, Zika and tagged Aedes aegypti, infections, mosquito, zika by Marie Benz MD FAAD. Bookmark the permalink.